While I have a great deal of information on my Wood family, in this article I am going to focus in on my Great-grandparents, George and Lucy Turner Wood and their descendants. Both George and Lucy were born in and lived most of their lives in Clermont County Ohio during the second half of the Nineteenth Century. Clermont Co. is located on the Ohio River just east of Cincinnati. To learn more about George's family please see the article on My Wood Family. 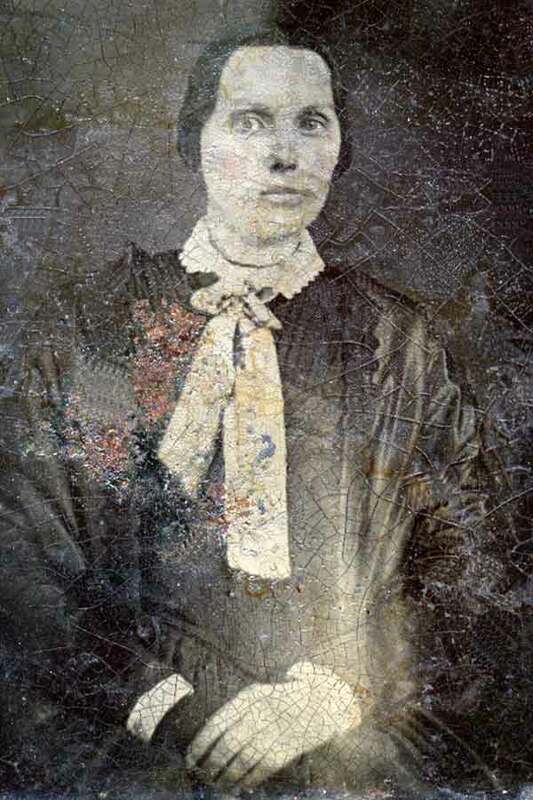 While I do not have a separate article on Lucy Turner's family, there is a good deal of information on her father, Ezekiel Edwin Turner, and, she is descended from the Mayflower's Richard Warren through her mother. George Absalom WOOD was the son of Dr. David and Mary Day Wood. George was born in 1848 and his father died when he was 5 years old. He apparently was raised by his father's sister Catherine Wood Barkley and her husband William Barkley. In 1869 George married Lucy Ann Turner, daughter of Ezekiel E Turner and Charlotte Welch Thompson. Their first child, Frank Clarence Wood, was born in 1870. By the end of that decade, three more children would follow; Mary, Walter (my grandfather) and Carl. I found the above photographs in the home of my paternal grandparents Walter and Mabel McCord Wood after my grandmother passed away in 1968. Since both my father and his parents had passed away, there was no one available to identify this couple. For a number of years I assumed that this couple was George A. and Lucy Turner Wood as the man bears a strong resemblance to my grandfather Walter G Wood and his brothers shown below. However, recently these photos have been identified as tintype copies of daguerreotypes taken shortly after 1840, too early to be George and Lucy born in 1848 and 1851 respectively, and likely wedding pictures. This early date is based on the fact that the daguerreotypes process was available in the 1840s and that the clothing they are wearing is from that period. As a result, I now believe that this couple is either George's or Lucy's parents: Dr. David and Mary Day Wood, or Ezekiel E. and Charlotte W. Thompson Turner. I have several reasons for this belief. Daguerreotypes were first taken in the early 1840s, and were expensive. Both George's and Lucy's parents were well off and could have afforded to have these photos taken. Next, I believe this is the correct lineage because of the strong resemblance of George's and Lucy's children to this couple. (Note the man's resemblance to two of their three sons and the woman's resemblance to their daughter Mary - see the photo below). Finally I have ruled out that these photos came from my Grandmother Mabel's McCord line based on other photos. 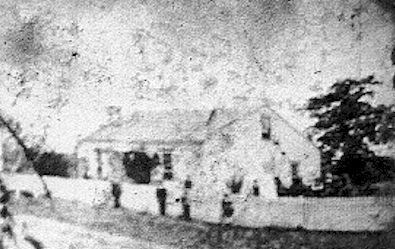 George A and Lucy Wood lived in the home shown above with their family beginning from 1876 until 1891. This photograph is from a slide I took in 1954 of a tintype photograph in the possession of their son Carl Erwin Wood. This tintype photo dated to around the 1870s. 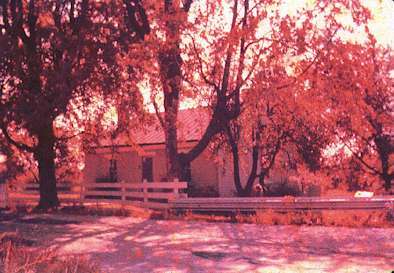 I believe the house shown above to be the same one in the one in the other photo shown above, but this second photo was likely also taken in 1954 (or possibly in 1961). I now know the location of this house based upon information from a newly found cousin, Jack Carl Wood, who sent me a genealogy report by Clair McVickar Ward that contained the following information. In "1876, George A. Wood purchased a farm one mile east of Felicity, Franklin Township (Clermont Co., Ohio). Before George and Lucy Wood occupied it, it was owned by Jonathan P. Myers who is reported to be a staunch abolitionist. Built before the Civil War, the Myers brick and frame house served as a "safe house" link in the underground railway for escaping slaves on their way to freedom. The bricks in the house were made from the clay beds on the farm and burned in Myers' own kiln. The secret cellar hideaway so carefully built under the house was accessible only through a small trap door in the kitchen, concealed underneath Mrs. Myers' flour barrel. Ventilation for the secret "dungeon" room was cunningly provided by laying the brick walls in a zigzag pattern, so that air was admitted, but no light. George A. 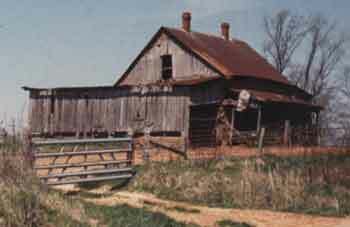 Wood and his wife sold this farm in 1891 shortly before the family moved to Science Hill, KY." This house has reportedly been destroyed. Lucy's parents, Ezekiel E. and Charlotte W. Thompson Turner gave George and Lucy a family Bible in 1872. Many marriages, births and deaths were recorded in this bible. It has been passed down through the family and I was able to see and photograph this Wood Family Bible. The last time I saw the Bible it was in possession of the Great-grandson of Frank C Wood, David Wood of Bradenton, FL. Lucy's father, Ezekiel Turner, died in Tate Township in 1889. His will, dated April 26, 1889, and probated June 14, 1889, provided daughter Lucy Ann with the funds to purchase a farm of her own in Kentucky. On April 13 of 1891, Lucy A. Wood of Felicity, Clermont County, OH, purchased a 126½ acre farm in Science Hill, Pulaski Co., KY from Wilson and July Nicely in Cincinnati, OH, for the sum of $3,000. This tract was situated in beautiful rolling farm lands on the waters of Pitman Creek at the corner of Hamm Road (now Heaton-Ford Road) and the Science Hill-Union Church Road, and was the first of her two tracts totaling approximately 166½ acres, which would be known as the "Lucy A. Wood Farm." A month later on May 20, 1891, her husband, George A. Wood, purchased his own tract of 42 3/10 acres on the west side of Hamm Road also by the waters of Pitman Creek from John Osborne, a bachelor, of Pulaski Co., KY. This tract was adjacent, but not adjoining his wife's farm. Cost: $420. Lucy Ann purchased her second tract of approximately 40 acres on Pitman Creek from H. J. Hamm and his wife Emma of Pulaski County, KY, on January 29, 1892 for $900. The Wood family home (above) facing Hamm Road (Heaton-Ford Road) was a simple two story, six room frame house with a peaked roof of corrugated tin and one window in each gable end. It appears to have been heated by two central brick fireplaces serving three rooms on each floor. The sturdy old house, much neglected over the years, was still (circa. 2000) standing by the dusty roadside and serving as a livestock shelter. 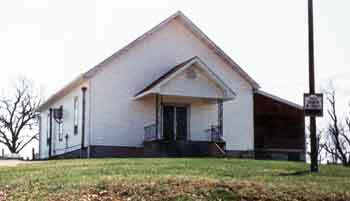 The family attended the Union Church (Church of Christ) (below) near their farm. The Woods lived on their farm for less than two years before George A. Wood's sudden death on May 30, 1893 at age 44. Further disaster struck the family after Thanksgiving, when Lucy Ann died on December 8, 1893 at age 42, leaving the four children orphaned: Frank - 23 years old, Mary - 22 years old, Walter (my grandfather) - 19 years old, and Carl - 17 years old. George and Lucy were buried in the Union Cemetery behind the Union Church. A photo of their tombstone is in the Exhibits. Neither George, nor Lucy Ann had made a will and under the laws of Kentucky the four children jointly inherited the entire holding at their mother's death. Letters of Administration were granted to Frank C. Wood, the eldest son, in Pulaski County Court, Somerset, KY, on December 27, 1893. At the same Court Session W. G. Wood and Carl E. Wood, minor orphans over the age of 14 years, chose their sister Mary L. Wood as Guardian ad litem with John J. Ivens, their neighbor, (and soon to be the father-in-law of Frank Wood) as surety to protect their interest in their mother's estate. The four children retained the 166½ acre Lucy A. Wood farm intact until February 18, 1898, by which time the three boys had long since decided to pursue careers in other states --Frank in Milwaukee, Wisconsin, and Walter and Carl in Sioux City, Iowa. In the early part of 1898 the Lucy A. Wood Farm was resurveyed for division. Between February 18, 1898 and September 19, 1908, after conveying various small parcels back and forth between them, Carl E. Wood purchased 140 acres (subsequently resurveyed as 147 acres) of his mother's 166½ acre farm, which he and his wife Addie R. Wood sold on October 10, 1910 to W. O. Bastin for a small profit of $773. The Lucy A. Wood Farm again proved to be more of a curse than a blessing for the new owner. W. O. Bastin ignored the old Wood home and built his own imposing house on the land. He brought interior decorators and even a mural artist from New York City at great expense to create the ideal country gentleman's seat, only to sink deeply into debt and to be forced to sell out his holdings. My grandfather Walter G. Wood joined his younger brother Carl in Sioux City, IA during the early 1900's. He sold his 90 acre share of the Lucy A. Wood Farm to his brother Carl for $1,000 on September 19, 1908. Shortly afterwards on January 25, 1909 Walter married Mabel Maude McCord in Sioux City, IA. In March the next year, my father Clifford was born to them. Walter and Mabel Wood farmed in Woodbury County Iowa until the first rugged years of World War 1, when they moved to the warmer, easier climate of the small farming town of Fellsmere, Florida in 1917. (It is noted on Walter's World War 1 Draft card that he was exempt because he was a farmer.) Extensive drainage projects in the 1913-16 period were turning the rich marshy "muck" soil into extremely fertile and arable farm land. Land was cheap. Another frontier was beckoning settlers. Walter G. Wood, his wife Mabel and son Clifford were part of this early group of pioneer farmers who experimented with various cash crops including sugar cane, which often soared to over fifteen feet in height in this rich soil. Walter continued farming until the late 1940s when he suffered a disabling stroke which forced his retirement. He died in 1959 but my grandmother remained in Fellsmere and continued to keep a large garden and her chickens until her death in 1968. In 1930 my father Clifford R. Wood at age 20 married Olive E Brown. Apparently due to the hard times during the depression left Fellsmere to find work in Miami. They were divorced there by 1935. Dad then moved to Washington DC, possibly with one or two close friends, where he attended college working towards an accounting degree. While still in school, he got a job with the US General Accounting Office. He met my mother Saidee E. Dowling not long after arriving in DC and they were married on Christmas Day 1940. A year after they married they were watching a Washington Redskins football game on Sunday Dec. 7, 1941 when it was announced over the PA system that Pearl Harbor had been attacked. This event brought the US and my father into World War II. Using his skills gained as an auditor, and now with two years of college, he entered a special Selective Service program and was drafted directly into Officer Candidate School of the Army Air Corp where he rose to the rank of Captain. After the war, he was discharged and managed the Potomac Hotel, one of my mother's Dowling family's hotels in DC. My mother inherited this hotel on the death of her father, Albert L Dowling in 1948. The Potomac Hotel was sold in 1959 and in 1960 my parents purchased the Queen Anne Hotel in Miami Beach Florida. (See here for more on the hotels.) After selling the Miami hotel, Clifford developed some property he owned in Homestead, Florida. While living in Homestead, Saidee developed colon cancer in the Spring of 1966 and died shortly before Christmas that year at age 56. Eight months later at age 57, Clifford died suddenly at home or an apparent heart attack. Cliff and Saidee had two children and at least one still-birth that I am aware of. I (Walter) was the oldest son. My brother Gene, 8 years younger, suffered from severe Down's Syndrome and had to be institutionalized because he required care for all his life. For information on others in this line please see the Descendant Chart of John Wood Sr. and the individual narratives.